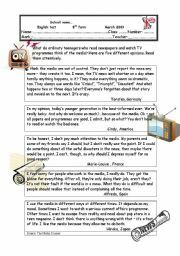 A test about teens´ opinions on different media. 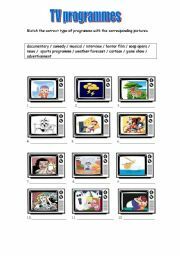 it includes reading tasks,types of tv programmes and newspapers, passive voice, connectors, present perfect/simple past and a composition. Get informed!!!! Let´s match! The words are shops and the pictures are different products. I hope it´s useful ! 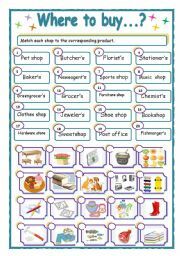 Here you can find reading comprehension tasks, grammar exercises(phrasal verbs,passive voice), vocabulary exercises on technology and text-writing. I hope it´s useful ! 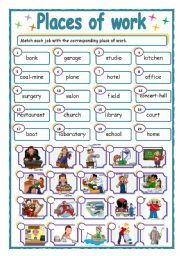 The words are places of work,the pictures are jobs. Just match them! The template was taken from here, the clipart from Phillip Martin and photosearch. London will be the host of the next Olympic Games in July! the city is getting ready.Why don´t you do the same? 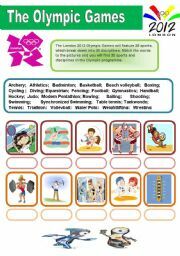 these 2 pages contain the main sports and disciplines in the olympic programme.Get set and go!!!! 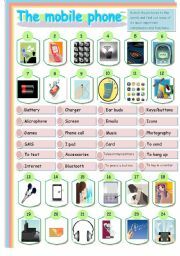 Do the matching and find out some of the most important components and functions of the mobile phone. The template was taken from here! Thanks.Key included. 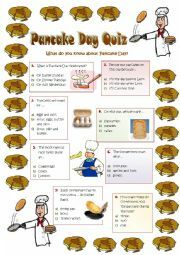 A simple quiz to celebrate this day. Key included. It was reported last year because of watermarks! Now, it´s OK! Happy Mardi Gras! 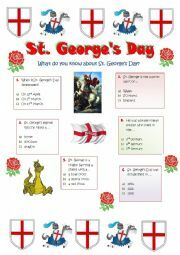 Next Monday is St. George´s Day, the patron saint of England. Do this quiz and find out more information about it. Key included. This test is about HEALTHY LIVING/FITNESS. 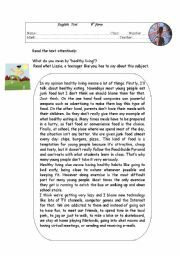 It includes reading comprehension(T/F, opposites, gap-filling), reported speech,quantifiers and a composition on the topic : Keeping fit! I hope it "FITS" you!! HOW DO YOU LOOK IN YOUR NEW CLOTHES? Do you look trendy? old-fashionable? Are your clothes too tight or too large? 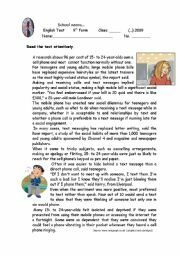 Have a look and find out. there are different adjectives to describe your look.